A great bundle for kids, the Observer 60mm Refractor & Starter Kit offers jaw-dropping views of the Moon's craters, Saturn's rings, and more! This is a great telescope and accessory kit for kids interested in astronomy and space. The Orion Observer 60mm AZ refractor telescope is a wonderful starter telescope well-equipped for visual adventures under starry skies. The Observer 60mm is a full-fledged refractor telescope complete with everything you need to start enjoying the night sky like never before. The extra goodies included with the Observer 60mm Altazimuth Refractor & Starter Kit are ideal for beginning backyard astronomers. This value-packed telescope and accessory kit will make a great gift for any child interested in exploring starry skies! 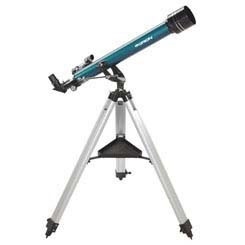 A classic refractor telescope with precision glass optics and great portability, the Orion Observer 60 is a complete backyard telescope package that includes the refractor optical tube, a host of accessories, and an adjustable aluminum tripod. It is especially popular with junior astronomy enthusiasts, thanks to its simple operation and traditional appearance. The Observer 60 Altazimuth refractor telescope weighs just 5.8 lbs. total when assembled, including the mount and tripod, making it very easy for anyone in the family to transport from the house to the backyard for a night full of stargazing adventure. The Orion Observer 60 Refractor Telescope offers higher quality and more reliable performance than any telescope you'd find in a department store. Featuring an aluminum telescope optical tube and all-glass optics, including a fully antireflection-coated 60mm achromatic objective lens, the Observer 60 yields crisp, bright images of the night sky. The altazimuth mount provides smooth motion in both altitude (up/down) and azimuth (left/right) axes of motion, and the sturdy yet lightweight aluminum tripod is adjustable for crowd-pleasing performance and comfort. There's even a handy accessory tray included that attaches to the tripod so you have a convenient spot to place your eyepieces and other astronomy accessories.